The Book Date : Revenants: The Odyssey Home. 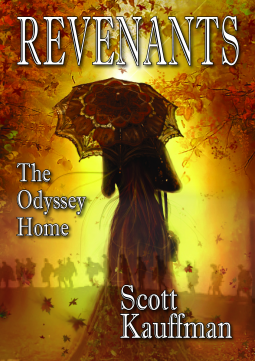 I read Revenatns:The Odyssey Home by Scott Kauffman during that time period celebrated as Armistice and Veteran's Day. Purely by accident, but a very fitting time to read it. It is the story of Betsy being sent to do candy stripe 'volunteer' work at a local VA hospital, where she meets up with all kinds of injured. Betsy has just lost her beloved brother Nathan to the Vietnam war, and is grieving his loss. Through observation and curiosity she finds in the attic a soldier kept hidden, badly injured and from a previous war. The story follows Betsy's time at the VA hospital, her working along side her younger brother and Matt MacLain a young reporter to track down who the mystery man is. And what a tangled web it is. There are quite a few twists and turns. There is one horrible Congressman who seems to be very crooked and self serving and who managed to evade service int he army. He is not above some horrible bullying. Part of the story focuses on Betsy and whether she will ever find healing from the grief of the loss of her brother, it is her journey and ultimately one of finding herself and choosing to live. Something those killed in war do not have the opportunity for. The book brings home the rawness and horror of war and the terrible consequences for those who return terribly wounded. The story links to The Odyssey, and for those who understand that then I am sure the book will have even more meaning for them. While this story was not quite what I was expecting, and not the in the style I usually read, I did find myself engaged and wanting to read on. What a coincidence, and how fitting, that you happened to read this book during Veteran's Day. I have siblings that have served, and one of them was deployed to the Iraq war. This book would hit too close to home for me. It's interesting that the story links to The Odyssey. Thanks for your thoughts, Kathryn. What an interesting premise to base it slightly off of Odysseus's journey. Thank you for a review on a book and author both new to me. I haven't seen a lot of books with characters from the Vietnam War. This strikes a chord for me, as I clearly remember seeing friends off to that war, and then seeing how emotionally wounded they were afterwards.